~~Okay. I know I'll be dating myself here, but I remember playing Super Mario Brothers for hours with my little brother and sister. We loved that game, lol. We got our Nintendo when I was in the 5th grade so that would be what... 17 years ago! Wow how time flies! My not-so-little-anymore brother even has a shirt that says "Old School" with the Nintendo controls on the front. 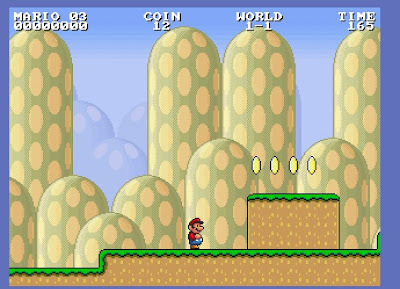 ~On our iced-in days, Sierra was having a lot of fun playing some games on www.noggin.com and it made me remember my Mario days. So I looked it up and, guess what; You can play it online! Just go here. ~~It took me a while to get my fingers coordinated, but it all came back. It was a funny deja-vu sort of feeling. Sierra thought the game was hilarious! She laughed and laughed and wanted me to teach her how to play. Hmmm. Does that count as passing down a family tradition? ~~Now...If I can just figure out a way to get that silly theme song out of my head!